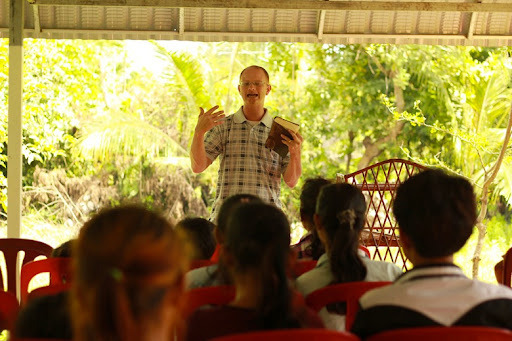 If you kept up with my recent Cambodia Trip posts you know that I had the wonderful opportunity to visit my friend Chad and his family where they serve in Ta Khmao, Cambodia. The purpose of that visit was for Chad and I to work on a video report for his upcoming furlough trip home. (see Here) Well I am glad to say that It was great to see the Phillips family again tonight, as they have finally made it back to Georgia. Seeing how they will be able to be home in Loganville for Christmas and the new year, i thought it would be good to introduce each of them to those members of Victory Baptist Church who have not met them yet. Here are some pics that I got on my trip. I hope that they will help you get to know and remember the Phillips family. Their oldest Child is Elizabeth. 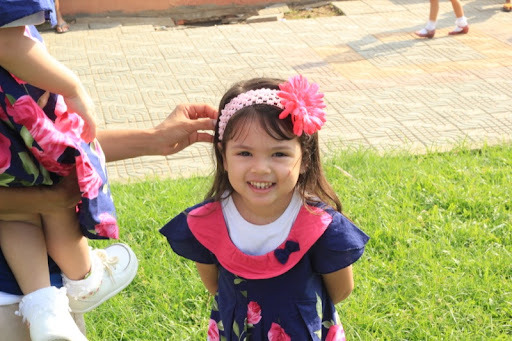 She is 4 years old. Whether she was singing a song, or giggling at something funny, I truly enjoyed seeing her joyful spirit each day of my stay with the Phillips. 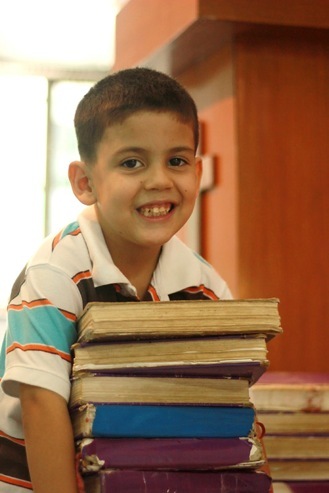 Next is Judson who is 3 years old. I think the word that best describes him is “Imaginative”. Just look at the pictures, need I say more. I can just picture the thought cloud hovering over his head with some crazy story or stunt he is thinking up. haha, Judson is definitely a lot of fun to be around. 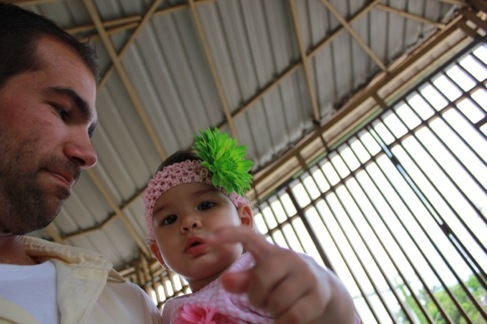 Last is the little girl that many of us have prayed so much for. 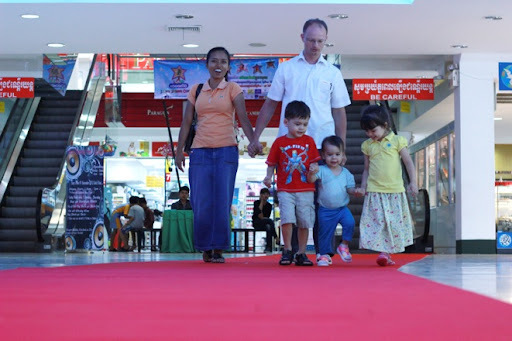 After just getting to Cambodia and some potential pregnancy complications coming up, the Phillips had to head to Thailand. 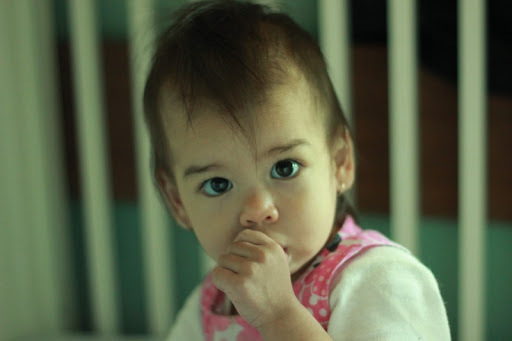 Emily Faith Phillips, “Bundle”, was born 16 months ago in Thailand, healthy and strong. You can read more about her name here. Even at this young of an age I could already see some of her personality through her many facial expressions. On more than one occasion I would be passing by her playpen and see her giving me a look with her dark brown eyes saying, “you don’t have to pick me up and carry me around if you don’t want to, but I sure would appreciate it.” haha, how can one resist? On Monday, my departing flight was not until late that night, so we were able to take advantage of the full day. 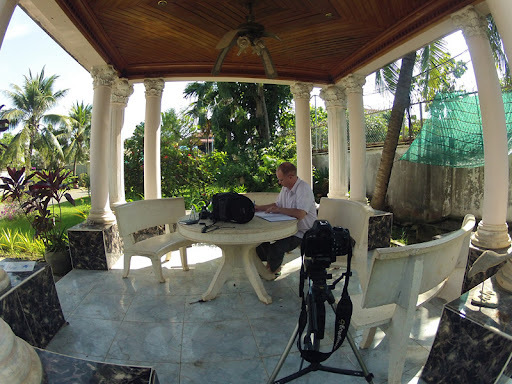 In the morning we did some final work on the video and then headed out for lunch. We headed toward the riverside area and were planning a boat ride. This is a very scenic stretch which included the former King’s Royal Palace and a row of national flags. Chad told me that just about a week before this area was flooded with Cambodians and visitors mourning the recent death of King Sihanouk. (More info Here) About the boat trip, Chad had mentioned how they had done this a few times before. We would show up on the docks and a bidding war would begin as the boat drivers competed to see who give us a ride. Much to my dismay, it did not go down like this. haha! Apparently, there had been too many altercations with the boat drivers recently, so the process was made to be much more civilized. 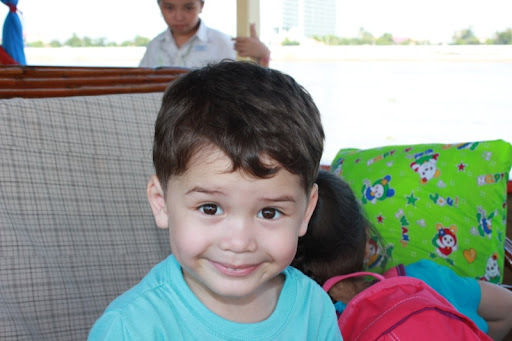 The boat ride was awesome. When you get a boat, it’s just for you and your party, so it’s very fun and relaxing. On the ride we got to see a fishing village on a nearby island, and also a beautiful view of the Phnom Penh skyline from the river. All of this was the backdrop for our lunch from “the Pizza Company” and a few friendly (sometimes) games of Rummikub. After the boat ride, it was back to the house to pack and prepare for my 25 hour trip home. Ok so these next posts are over a week late, but better late than never. 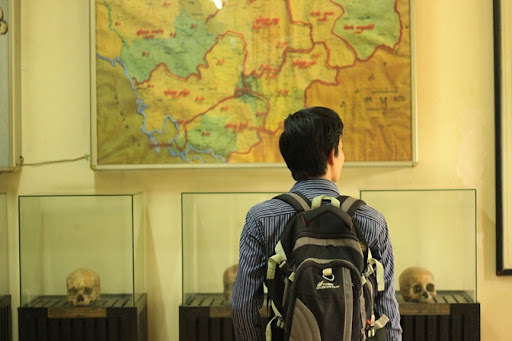 On my last days in Cambodia, last Sunday and Monday, there were several things that I thought readers would find interesting. 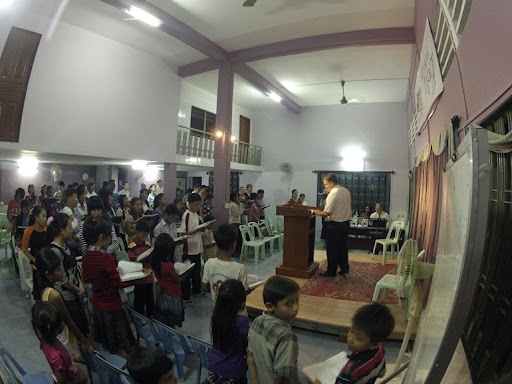 On Sunday morning we headed back to Good News Baptist Church in Phnom Penh. This was a special time for the Phillips family. Since they have moved to Ta Khmao, and are headed to the States for furlough, it was their last time to see many of these folks for a while. 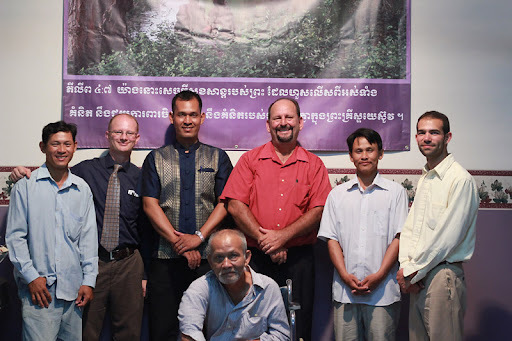 They lived and served here at the church for most of their first 2 years in Cambodia so the church members were glad to see them before their trip. 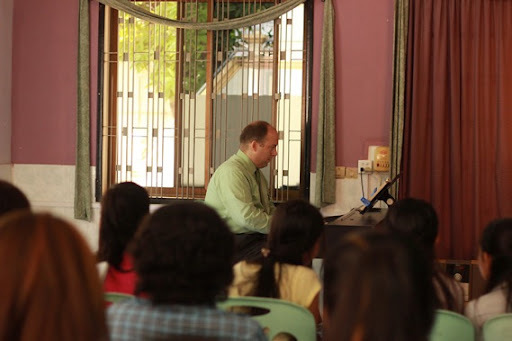 We had a great Sunday School hour as Missionary Stephen Benefield led some music and singing for us to use for Chad’s video. The AM service was good also, but since I don’t understand the language I was forced to sit in the back and make faces at Emily. This was quite entertaining as you can see. 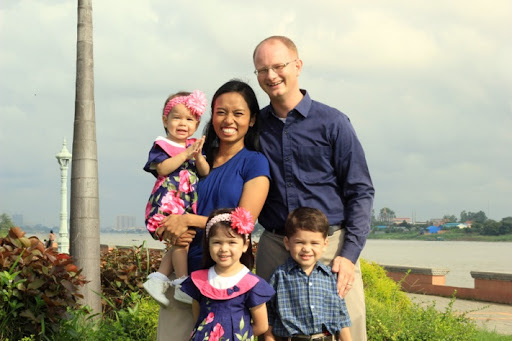 The Benefield family has a wonderful family and ministry here in Cambodia. It was a great pleasure to meet them as I had heard so much about them from Chad. I had a wonderful time with them on Thanksgiving Day as well - they let me crash their party, complete with Turkey, stuffing, and all the fixins’. In the services that I was able to attend there, it was obvious that the people have the joy of the Lord, and are stirred by the messages. The Lord is really using them here in the capitol city; please pray that the Lord will continue to bless the Benefield family and Good News Baptist Church. On Sunday night, we just had a few minutes walk to Liberty Baptist Church, which is just around the corner from Chad’s house. It was great to see the Shull family, pastors Proh and Toh, as well as the church members one last time. We had a great service, and little while to fellowship before we had to head back home. 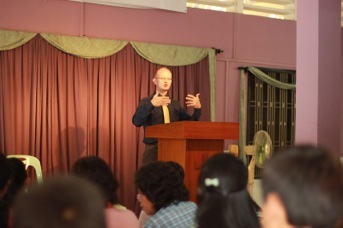 It was great to talk to some Cambodian teenagers as well. Some of them were working on trying to go on a special trip - all they had to do to go was memorize the book of Phillipians! Last Friday was also a great day. We got together with some families from the church the Phillips family will be assisting when they return from furlough. 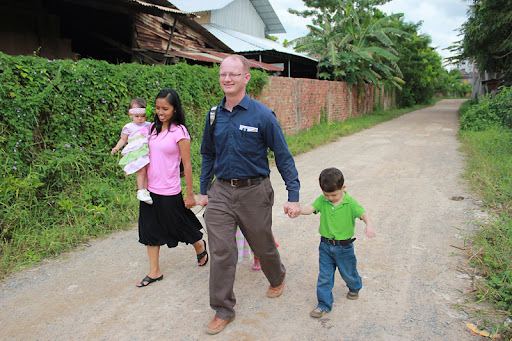 First we took some family pics and then headed out on visitation. 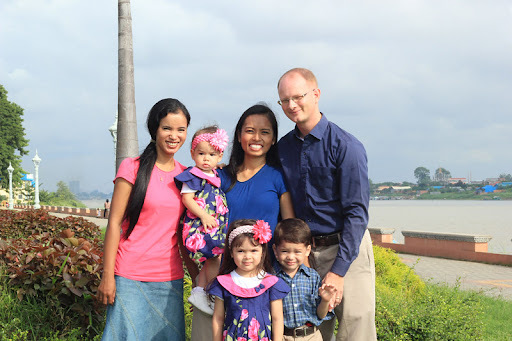 Here is the Phillips family along with their friend and helper, Theary. 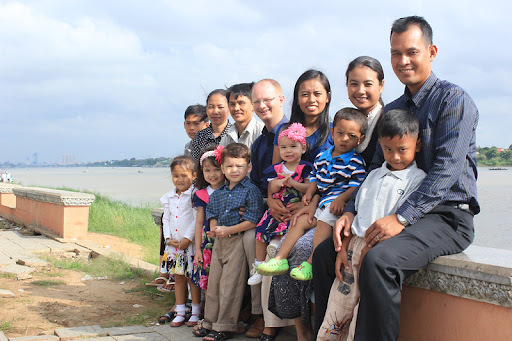 Also, there is a pic with the family of Proh and Toh with the city of Phnom Penh in the far distance. These men and their families have been a joy to get to know over my time here. 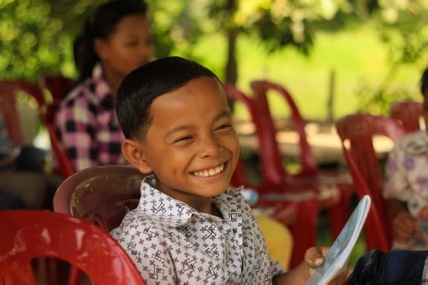 It is great to see the joy of the Lord in their hearts as they serve here in Ta Khmao. 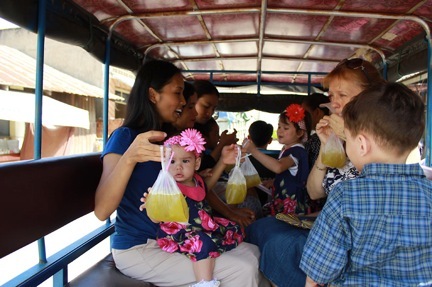 During visitation I was introduced to a Cambodian treat, Sugar Cane Juice. At first I was hesitant to take a sip from a yellow bag, but it turned out to be quite refreshing. Should you ever find a yellow bag in the United States, I would not suggest consuming the contents. 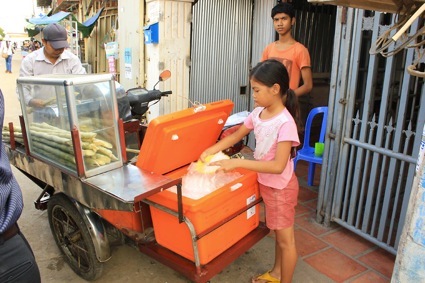 However, should you have opportunity to get yourself some fresh sugar cane juice, I can heartily recommend it! 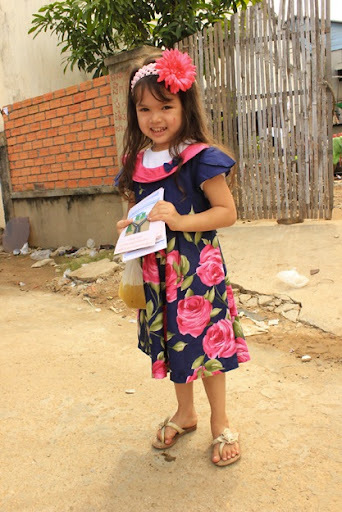 Probably the greatest day that I have had so far here in Cambodia, was on Wednesday. 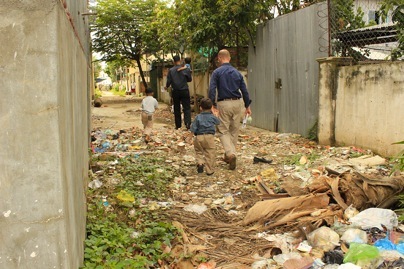 Chad and I headed out early in the morning for their “Village Ministry”. 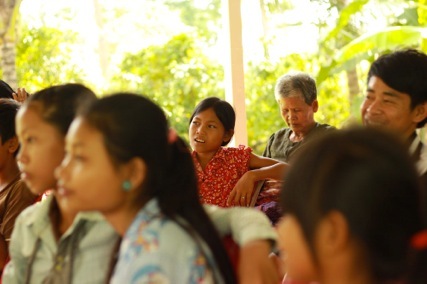 About 2 hours outside of the city is a farming town, Kampot, where they have a faithful group of people that come together on Wednesdays and Saturdays. 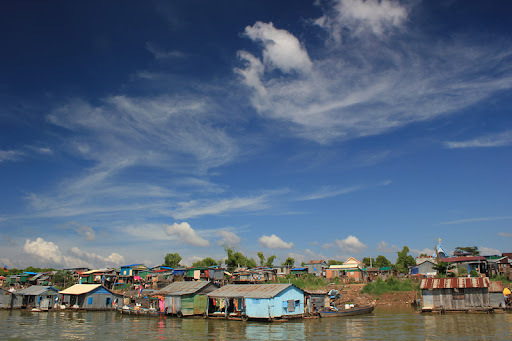 The trip out of the city into the countryside of Cambodia revealed a completely new perspective of the country for me. While the city is busy and fast paced, the farming communities outside the city run at a more peaceful pace. Not only was I able to enjoy the beautiful scenery on this trip, but also the wonderful service that we had. These are my pals Lin & Lei. It was a joy to meet them and see their enthusiasm for the ministry here. They were the first ones to arrive and the last ones to leave. 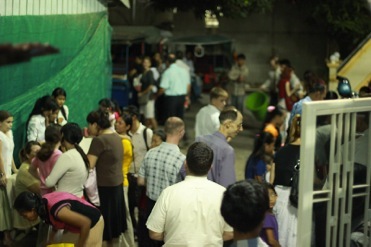 On Wednesday evening, we headed back into Phnom Penh for a service at Good News Baptist Church. There were also several other churches coming for this special service and we really packed out the auditorium. 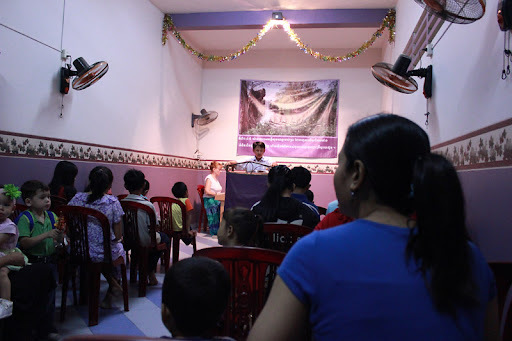 There was singing, a testimony time, and a message by Pastor Benefield. All this was followed by some food and fellowship afterwards. While I had no idea what was being said in the service, I was able to recognize some of the tunes and join in English. It was a wonderful service! On Tuesday everyone went to go get some ice cream. 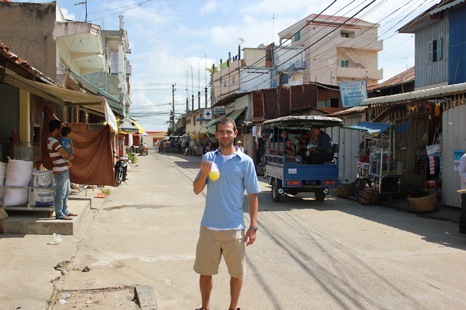 It was fun to get out with the family and see downtown Phnom Penh. After that I got to meet Hawn, Chad’s language teacher. 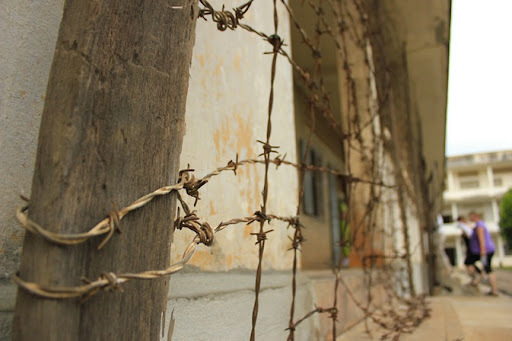 Instead of a normal class, Chad decided to take a field trip to one of the Prison camps during the Khmer Rouge - Tuol Sleng, also know as S-21, which is now a memorial museum. 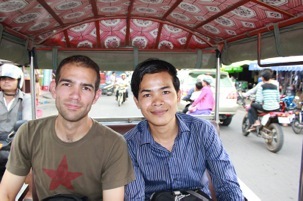 Chad did try to get some work done on the Tuk Tuk ride. 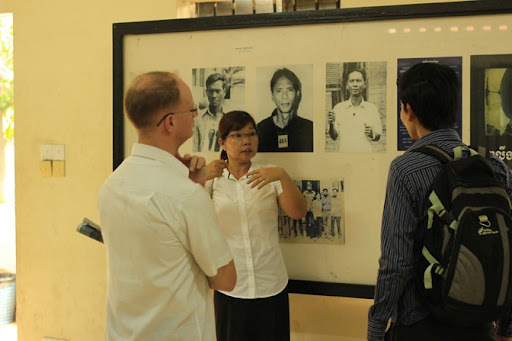 The tour of Tuol Sleng was very sobering, and really the saddest sight I have ever seen. 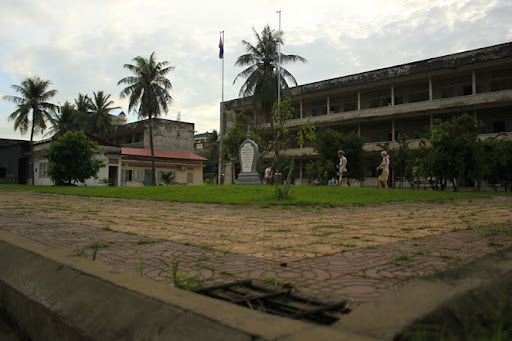 It used to be a Primary and High School in Phnom Penh but was turned into a prison and torture chamber during the Khmer Rouge. The things that come to mind when I think of torture are nothing compared to the things that were shown in this museum. This was far beyond the violence of war and really the most disturbing thing I have witnessed in my lifetime. What makes it even more impactful is that this is still in the heart of the city, it is only one of many of these camps, and that this happened just over 30 years ago. Below are some pictures of the camp. These do not show the terrible story of this camp, but for this audience I have tried to include only pictures that anyone can view. Hawn and our tour guide are the others in the pictures. This was Hawn’s first time going to this camp, it was very sobering for him as well. 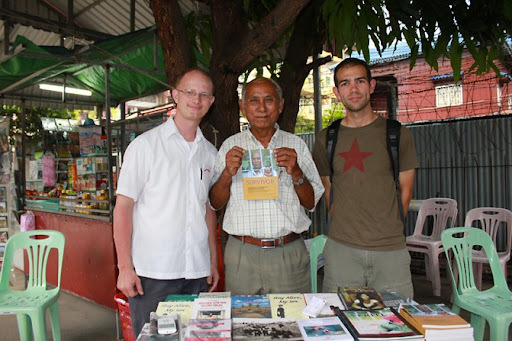 Also in the pics is one of the seven survivors who was selling his book at the museum, Chum Mey. Of over 12,000 prisoners, he was one of the few who lived to tell the story. This is a view from inside the rooms. You see 3 brick cells on the right. 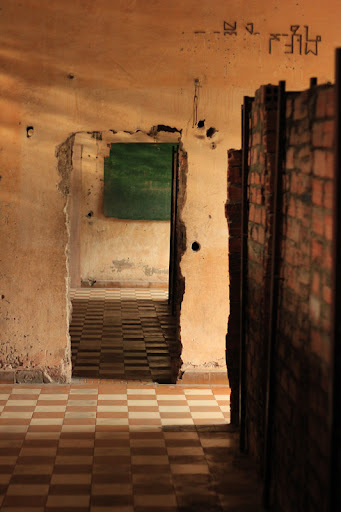 Each of these rooms were filled with several of these tiny cells where the prisoners stayed. The pieces of writing that you see on the wall at the top was lettering that remained from the school. 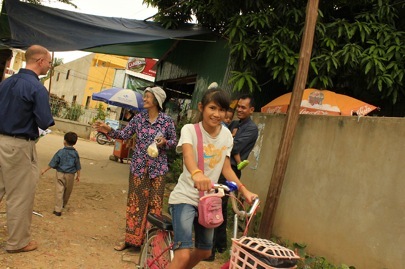 Cambodia Trip: Post 4 - More Moto Please! 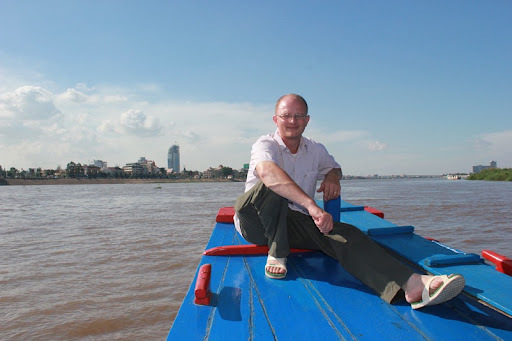 Monday, Chad and I headed out to Phnom Penh and Ta Khmao. 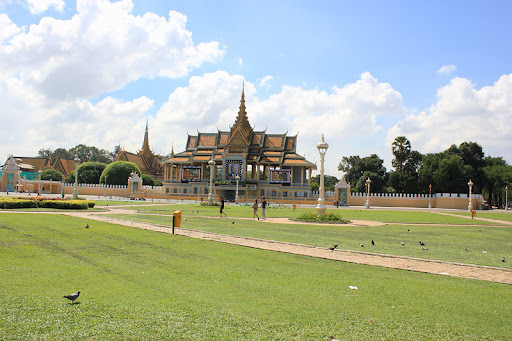 Here are some pics from Phnom Penh, I will try to put up some more vids later. We stopped by Chad’s old house in Phnom Penh. Good News Baptist Church is the building on the right. 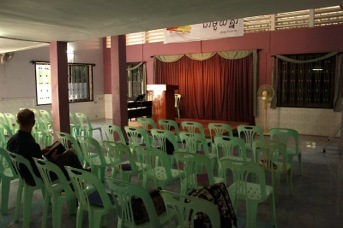 We will be having a special service here on Wed. night with several other churches coming. I am really looking forward to it. When the Phillips were here, they had to install that fence around the upstairs that you see. Monkeys would get in that tree and come up on their porch. hahah! Here we are in a traffic jam in Phnom Penh, trying to turn left. The building on the right is the tallest building in Phnom Penh, but will soon be surpassed by the building on the left which is under construction. You will see it in several of my blog pics if you look close. Ok, so I have no idea how much gas prices are here, but 5,150 of anything is just ridiculous! We were headed to KFC for lunch, but I quickly changed my mind. haha!